ConceptDraw DIAGRAM is a powerful tool that helps you produce bubble charts using software with fine-tuning objects. ConceptDraw DIAGRAM allows you to create a really professional finished chart document. ConceptDraw Arrows10 Technology gives drawing direct connectors that make you flexible for great results. Sample 1. 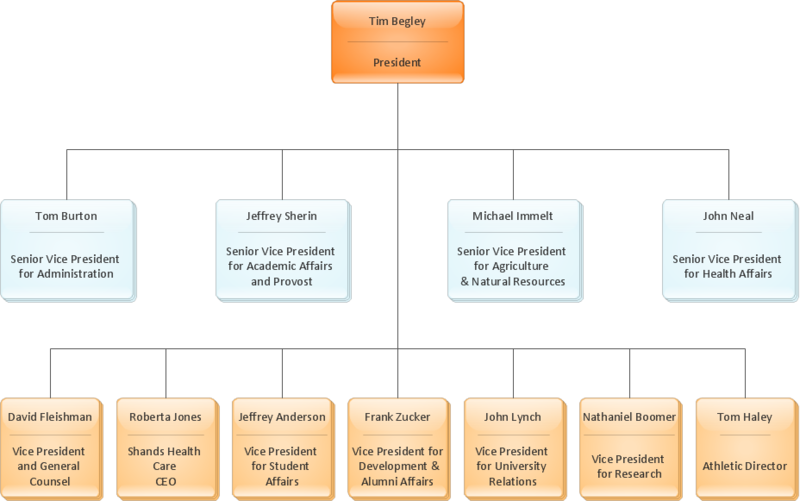 Organization chart - University. ConceptDraw the best business process modeling tool to make flow chart diagrams. Start creating your own flowchart with ConceptDraw DIAGRAM v12 and accomplish great results in the moment. This is the best program to make flow chart diagrams that gives users the ability to simply draw any type of flowchart. The fast creating visualization for the structural data with the vector stencils from object libraries by using RapidDraw technology makes ConceptDraw DIAGRAM v12 the first program in drawing flow data. Make diagrams, charts, workflows, flowcharts, org charts, project charts easily with ConceptDraw software. ConceptDraw DIAGRAM v12 is a Mac OS X and Windows software. Numerous vector stencils, samples and templates created by designers are included in the basic package. This is classic flowchart maker which exactly follows the industry standards using flowchart symbols geathered during a ten years into solution park.